Amazon and Barnes & Noble have always been good at building portable reading devices. But what happens when video and apps try to elbow their way into the pure reading experience? Well, you get devices like the Nook and Kindle Fire HD – and now the Kindle HD 8.9-inch. This large tablet is so big that I’d be loath to call it an ereader at all but rather a fairly inexpensive, all-in-one device intended as sort of a “second tablet” in a home that may already have a number of these sorts of devices lying about. It’s also excellent for folks suffering from poor eyesight and who want a bit more screen real estate. I won’t dig too deeply into this device because it is very similar to the Kindle Fire HD, which I found to be excellent (although I would give the Nook HD a bit of an edge for a superior magazine and catalog viewing, but it’s really just a question of which ecosystem you prefer). However, I think it’s important to note that this device is, in short, the first tablet Amazon knowingly released. For as long as the Kindle Fire has been on the market, I’ve said that it and its 7-inch brethren are ereaders. While you can view video and download some apps onto these devices, they were primarily designed for reading. Books are usually front and center, the store is focused on the book experience, and most media is streaming-only, which prevents them from being useful on long-haul flights. The 8.9-inch version of the Fire, however, is a tablet. It has a huge screen – bright and very legible – and at 1920 x 1200 pixels, it gives the Retina iPad a run for its money. The bigger screen also affords more real estate for reading and viewing web pages – a benefit if you can’t see well or are trying to view complex content like textbooks. 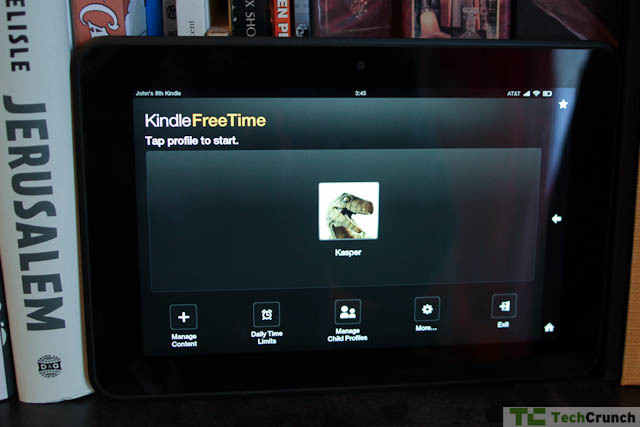 Otherwise, this is a scaled-up Kindle Fire HD. There is an HDMI port next to the USB port, a set of recessed buttons on the top, and the same Kindle Fire HD styling. This device, however, supports LTE and Wi-Fi (at $499) and has an HD front-facing camera on the side for video chats. In other words, this thing is competing with the likes of the Galaxy Tab and Nexus 10. If we’re going to mention one big difference (and the Kindle Fire HD will get this feature as well) it’s Freetime, a protected environment for kids. This allows them to download and play games, read books, watch movies, and the like in an environment completely cut off from the rest of the device. For example you can add only a handful of apps and books. These will remain in the Freetime app for kids to play. When they’re done with the tablet, all of your books and data are safe. Short of the Nook’s multiple user features, this is the second best solution for ensuring the kids don’t mess with your bookmarks or delete a bunch of data. Can I unequivocally recommend this Fire to the average user? I would say no. A tablet of this size and style has a very specific space in the pantheon of tablets, and I don’t believe the Amazon app store and Fire UI are robust enough to support the tools users may want from a tablet at this price and this size. A similarly outfitted Nexus 10, for example, costs $400 without LTE while an iPad is nearly double that with LTE ($729), so you’re definitely getting a deal. It’s clear Amazon is playing on price here. However, is the price low thanks to expected revenue from users who are buying books, movies, and movies from Amazon on this thing? Yes. This device is subsidized by content. So it’s great for reading (if you like a bigger screen) and great for media (in some cases). But I didn’t find it fully featured enough to make me want to use it as an everyday tablet. As a coffee table screen, sure, and as a reader for someone with bad eyesight it’s a really good value. Any other use may be problematic. The 8.9-inch tablet means Amazon is gunning for its competitors. The list of those competitors obviously includes Barnes & Noble and its forthcoming big Nook HD, but it now also includes the iPad, any number of Samsung devices, and not to mention countless other tablets, bargain basement priced or no, that are available worldwide. By putting LTE in here, Amazon is suggesting you use this tablet like you would any other tablet out there, and that’s not quite true. I see two possible reasons to buy this tablet. If you need the big screen, for whatever reason, and you intend to perambulate within the closed garden of Amazon content and PDFs, this tablet is for you. If you’re a novice user who doesn’t need much power, this tablet is also for you. It is far superior to much cheaper devices out there running stock Android. But this is not a tablet replacement if you, say, intend to take this on business or create content. It’s just not all there yet, but that’s not really Amazon’s concern. I’m not as enthused by this device as others in its class. That’s my bottom line. As exciting as it is to get a bigger Kindle, there are better devices out there that are tuned to enhance the entire tablet experience, not just the close world of Amazon. And that’s fine by Amazon, I’m sure. The Fire, either in this configuration or in the smaller one, will be one of the hottest gifts of the season. I can imagine a million screens flaring on, millions of ebooks winging their way to reading nooks around the world. People will be impressed by the screen, the Angry Birds, and the Prime movies – all excellent aspects of an excellent product – and settle into a long winter’s read.